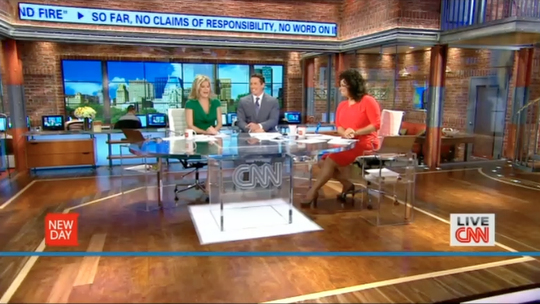 CNN launched its highly anticipated and much promoted new breakfast show this morning with a brand new set, fresh graphics and a familiar voice. The show’s set, designed by Jack Morton PDG, is finished in a red-orange faux brick and accented with glass paneling, industrial looking pillars and bright accents. 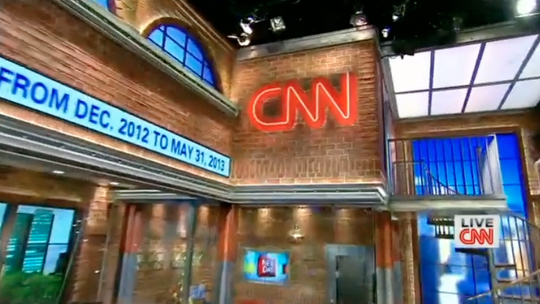 The main anchor desk, a see-through glass cube with the CNN logo etched into the front and topped with a round glass surface, is situated in front of an LCD array designed to look like loft-style windows overlooking a colorized skyline graphic. Scattered in front of this wall are some workstations with computer and video monitors. 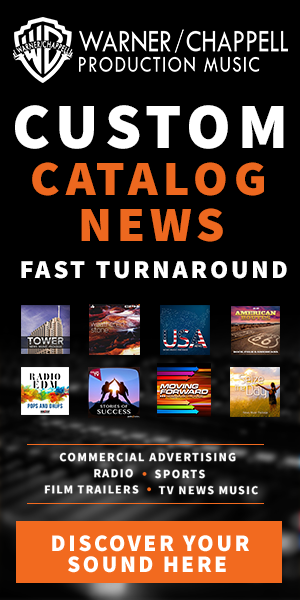 Above this span is a video strip that displays news headlines in a typographic treatment similar to the one used throughout CNN’s programming. Crowing this area of the set are arched, half moon shaped backlit transoms. On either side of the windowed work area are two enclosed glass cubicles that are fully visible from the main set. 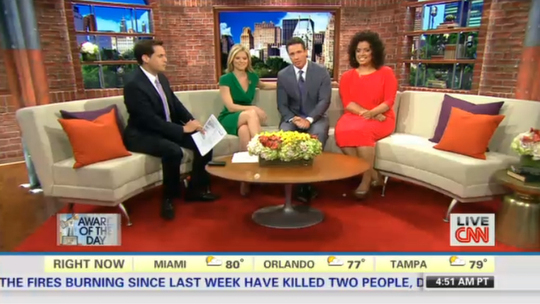 One is a green room with a sofa, similar to the open style waiting area found on “CBS This Morning,” while the other is a working weather office. Adjacent to the green room area is a spiral staircase that descends from a brick “tower” with a dimensional CNN logo mounted on it. The staircase serves as the main backdrop for news anchor Michaela Pereira, who sits at the main anchor desk with a small glass table for her laptop. 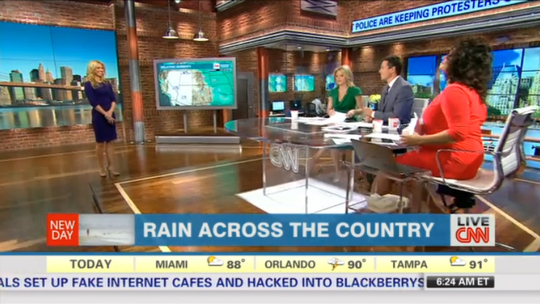 Adjacent to this area is a freestanding screen equipped with “Magic Wall” technology used for weather as well as a large 3×3 LCD array that’s used as a secondary background for the weather segment and a brandable, topical background for standup segments. The video wall is also used to toss to field reporters as well. The set also features a sofa area with a bright red carpet and backed by additional faux windows as well as open bookcases. Overall, the show’s set is a cohesive design, albeit slightly familiar. The loft like design and faux brickwork, as well as the open green room already mentioned, feel familiar to “CBS This Morning,” though CBS’s bricks are a different tone which does make a significant difference in the set’s appearance. 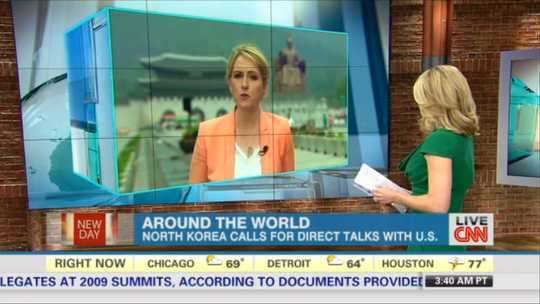 The show’s graphics, meanwhile, draw inspiration from both the show’s boxy logo and the glass cube anchor desk and are dominated by brightly colored 3D animations of glass cubes, including a sleek rendition of the show’s red logo. 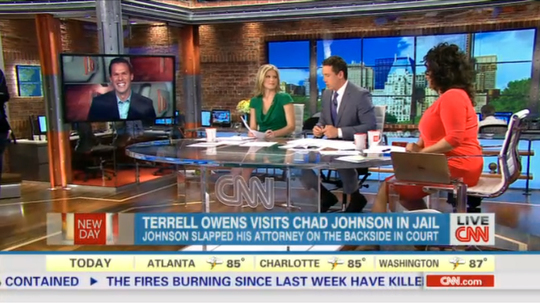 In the lower thirds and other graphical uses, CNN has opted to retain its familiar bug in the lower right with show branding on the left with a simplified, less glossy version of its standard lower thirds. 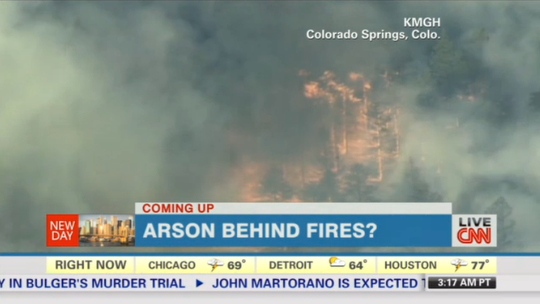 The show also retains the network’s ticker, with the addition of a band of weather information above it with a pale yellow background. 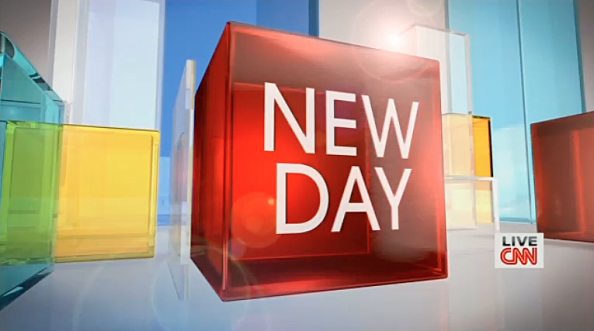 The show’s graphics give “New Day” a fresh look that’s also significantly less soft than graphics typically seen on morning shows which often shy away from the sharp, crisp lines found in this package. 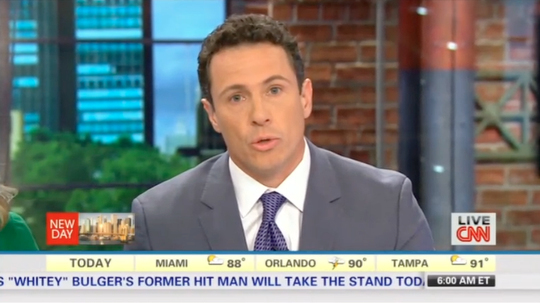 From a graphics standpoint, the show could benefit from some more thought out lower third graphics that tie a bit better into the glassy look found in the fullscreen elements. The weather ticker seems to add a bit of unnecessary clutter, especially with the yellow background that gives it bit too much visual weight. 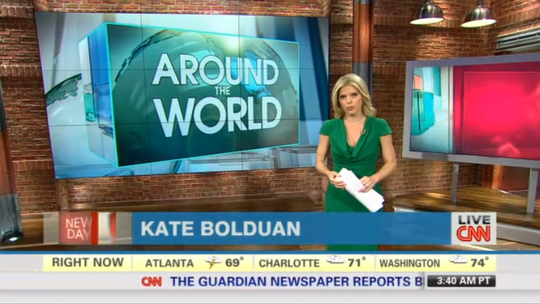 CNN posted a video tour of the new studio on its website late Monday. You can view a full gallery of the set here and the graphics here.